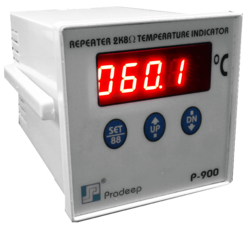 Providing you the best range of ohm input repeater - p900 with effective & timely delivery. Being a patron focused organization, we are engaged in manufacturing, supplying and exporting 2.8k Input Repeater. Offered TAP position indicators are in-tandem with the established quality standards. With an aim to ensure the same, we manufacture these position indicators by using high grade raw material, sourced from trusted vendors under the supervision of professionals.